This is the kind of puzzle that used to just need three long themers, but Will has challenged me to go for at least four including a reveal. This one has four PLUS a punchline. Lots of theme fill to get into a Monday. I had never heard of a BITEVALVE, but I needed a BITE other than BITE-SIZED so it would have a different meaning for BITE. Proud it's not been used. Recently went to hear David Mamet speak and he pointed out TSELIOT was an anagram of TOILETS. That was my takeaway from the Pulitzer Prize winner! 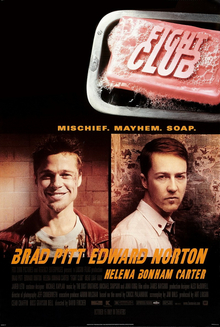 FIGHT CLUB! Now that was a movie that surprised and delighted me, in oddly unexpected ways. Acme plays on it today, hiding fighting words at the starts of phrases. KICK and PUNCH … them's fighting words! Don't groan. You knew I was going to say it. BITE and SCRATCH weren't as apt for me, as they don't seem very FIGHT CLUB to me. Man, that movie was violent! BITE and SCRATCH seem more appropriate for a Three Stooges routine. Of the themers, I liked PUNCH BOWL best, because it hides the meaning of PUNCH completely ... unless you're Tyler Durden, in which case you might actually punch a PUNCH BOWL. Talk about anger management issues. KICKSTART also hid the KICK meaning a little, since "kickstarting" a project goes away from a kick starter on a motorcycle. You do sort of kick a motorcycle's kick starter, though. BITE and SCRATCH don't hide their meanings at all within BITE VALVE and SCRATCH AND SNIFF. You bite a BITE VALVE to get water to throw. So again, I wasn't a fan of these two themer choices. A couple of blips in the fill, noticeably ARTE, OBLA, OFA right off the top. I think the latter two could have been avoided by spacing out the themers more. Putting KICK START in row five (instead of row four) would have allowed for a couple of black squares separating BITE VALVE and KICK START, allowing them to play more nicely together. EOSIN is such a toughie. Normally I don't classify anything as "not Monday material" – if the crossings are fair, what's the harm in forcing solvers to learn one new thing? But even having a pharma background, EOSIN feels like it could elicit an "I have to know trivia to do crosswords?" response from newbies. No Bueno! All in all, a good memory jog to a movie I enjoyed. Some missteps in execution, though. Average word length: 4.85, Scrabble score: 303, Scrabble average: 1.60.